Bride and groom embrace at Centennial Park in Munster, Indiana. 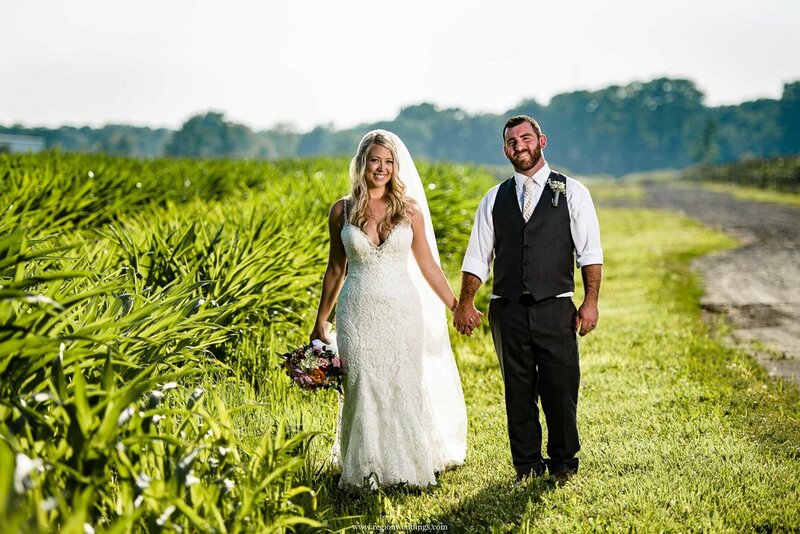 Steve Vansak of Region Weddings is based in Crown Point, Indiana providing wedding photography for the modern bride in all of Indiana, Chicagoland, Illinois and Michigan. Destination wedding photography is available upon request. Beautiful, artistic wedding photography, jaw dropping book designs and an easy going demeanor is what he is known for. "In wedding photography it's important to be able to deliver quality throughout the entire day" says Northwest Indiana Wedding Photographer Vansak. These photographs are meant to be passed on to the next generation. From candid moments during Getting Ready to the emotion of the ceremony - church or outdoors to the celebration on the dance floor, I will be there to capture it all. I love spontaneity, but I also believe in a rock solid plan so the day goes smoothly for the newlyweds, their families and their guests. I want this to be a fun day, as it should be." All day coverage is included in every package. Two associate photographers are on staff for additional coverage as well. Please fill out the Contact Form to set up a meeting and ask specific questions not covered here or call 219-779-7137. "Steve was fantastic!! I had to plan a wedding while living almost 5 hours away and he met with us on weekends, was super responsive via email and was just overall awesome. GREAT value overall and our wedding pictures turned out FANTASTIC. People are constantly commenting about how great they are and it is all due to Steve." - See Jessica and Mitchell's big day right here. "Steve was absolutley amazing when he shot our wedding! The amount of flexibility he has is truly unheard of. I cannot stress enough how much I recommend him!" - See Emily and Zach's wedding day right here. "Hiring Steve from Region Weddings was one of the best decisions I could have made. He was very informative, flexible, and did an absolutely amazing job doing my engagement and wedding photos. I would highly recommend him and I plan on using him for any other professional photos I take." - Take a look at Tiffany and Shane's big day right here. "Thanks so much for making our day just perfect! You made our day amazing by going above and beyond." - See Joan and Dan's wedding here. "Words cannot describe how much we appreciate the BEAUTIFUL photos you took for us on our wedding day." - See Krystin and Chachi's big day right here. "I had my wedding in August of 2016. I have to say I couldn’t be happier with my beautiful pictures all thanks to Steve! He’s so great, patient, and creative. Thank you again Steve for making my day unforgettable!" - Click here to view Karina and Abimael's big day. "Thank you so much for our amazing wedding pictures! It meant so much to have you as our wedding photographer." - See Melissa and Dustin's wedding day right here. "The engagement and wedding photos Steve took for our wedding were beautiful! He met our expectations and then some. I would strongly recommend him for anyone. You will not be disappointed!" - Take a look at Kelly and John's wedding right here.